Density is measured with a hydrometer, whose buoyancy increases as the water gets saltier. In the aquarium trade, most hydrometers also include a thermometer. The specific gravity at water level must be read with care; in fact, it is preferable to use the hydrometer outside the aquarium, as the movement of the water makes it difficult to read. In this case, decant the water into a test tube or a transparent container (a PVC bottle, for example) and float the hydrometer in it. 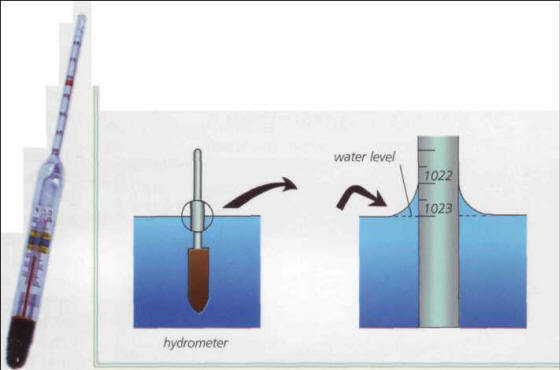 When it stops moving, read the value corresponding to the level of the water (1.023 in the diagram below, and not 1.022). To check whether your hydrometer is working properly, just measure the density of a distilled or very soft water: it must equal 1.000. The hydrometer, an indispensable tool in marine aquariums. УККО (Ванамеес , Таеватаат, Ванаиса), в карело-финской мифологии верховный бог-громовержец, представлявшийся в виде седовласого старца, который проезжает по небу на грохочущей колеснице и поражает молниями злых духов.